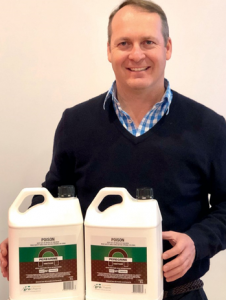 Crop protection products from Grochem Australia are taking on a fresh new look which will make it easier for growers and farm distributors to identify the company’s products. Grochem products such as Bordeaux WG (tri-basic copper sulphate),Coppox WG (copper oxychloride) and Fortuna Globe 750 WG (mancozeb) are the first to show the bright new branding. All 45 of the company’s fungicides, insecticides, adjuvants, plant growth regulators and specialty products will adopt the new look in coming months. “Rebranding our packs is one more step as we strive to grow our position in the Australian horticulture market,” said Ben Coombe, general manager of Grochem Australia. “This move follows Grochem’s acquisition of Melpat International in July 2017 and the integration of our expanding product portfolio,”he said. The new Grochem branding combines the distinctive Melpat ‘hoop’ with a single colour theme for each product, so the packs are more distinctive and easier for workers to identify in the store and the shed. Grochem Australia is a subsidiary of the Grochem Group in New Zealand, which has become a major supplier there, mainly to pome and stone fruit growers, since it was first set up in 1993. The company is growing rapidly to meet the changing needs of the horticulture industry in Australia, New Zealand and South Africa. “We are working with innovative researchers to develop effective products that are more environmentally sustainable and enable growers to meet consumer requirements,”Mr Coombe said. Mr Coombe heads up a small team in Australia, which combines the strengths of Grochem and the former Melpat business. He supports resellers in Victoria and Tasmania from Melbourne, while Samantha O’Donnell looks after customer service and administration. Meanwhile, Melanie Webber looks after customers in Western Australia and South Australia, including Mildura and Robinvale, with Hamish Turner focusing on R&D and technical support. Grochem’s latest recruit is Ashleigh Knight, who will support customers in Queensland and New South Wales, following several years in the crop protection industry.